Last Saturday I threw a little party for my friends. It all started when I received a PR blast from Calphalon and Williams-Sonoma. They were wrangling up food bloggers to throw parties on June 5 all across the country. They provided me with two of their new pans, a few little goodies and $100. I decided this was a good excuse to do something for a small group of close friends who deserved a fun afternoon out with the girls. The party ended up being lovely for so many reasons. The weather was perfect, time spent with friends was so lovely, and the food was fabulous! Normally parties are a chore for me, I’m not really the party-throwing type. But I had a blast doing this party! I was able to wrangle up some of my own contacts to really step things up. Sure, a Calphalon spoon was nice to give to my friends, but they deserved more. We ended up with some amazing food, and goodie bags that I was bursting at the seams to give to my friends. I wish I could have invited all of you, but my patio just isn’t big enough! So…on to the fun stuff! Tomorrow and Thursday I’ll share the recipes from the party with you, but today it’s all about the goods. Cambria Cove was amazing. They sent a cake from Elegant Cheese Cakes, filled with three layers of delicious cheese cake. Elegant Cheese Cakes is based in Half Moon Bay and the cake gets shipped to you. Can you believe this cake gets shipped in the mail? It’s a miracle! Cambria Cove also sent a giant box of Norman Love chocolates, which are not only completely gorgeous but also really fun and tasty to eat. And both of these gorgeous serving trays? Cambria Cove again. Without them, my serving table would have been only half as beautiful! A few words about the cheese platter while we’re here. Alouette sent their Extra Creamy Brie, which was very tasty with a thin, mild-flavored casing. I also bought some Honey Goat Cheese from Trader Joe’s (there in the back)…it’s my new favorite cheese. Now for the gift bags. What could be in there? I can’t wait to show you! 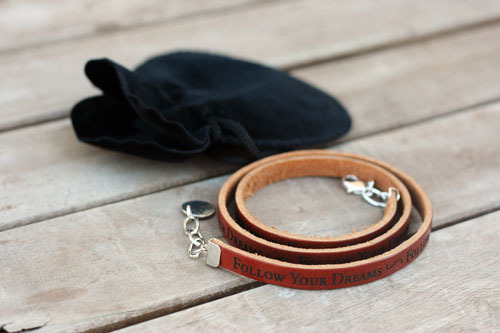 Dillon Rogers was AMAZING and gave everyone a triple wrap bracelet. I have a few things from Dillon Rogers, including my own triple wrap bracelet and this lovely necklace. Everyone loved their bracelets. P.S. Dillon Rogers is offering a special discount for all of you! Use the code DINNER to receive 20% off the entire website! I suggest you get shopping! I honestly, truly love their stuff and am so happy to be able to help get the word out about this great company. Cambria Cove also stepped up and gave each guest one of these beautiful Voluspa candles and this Cherub Collage journal. The Cambria Cove signature gift box is almost gift enough on it’s own! But of course the things inside are just lovely. I emailed my dear friend Ree, The Pioneer Woman herself, to see if she could swing some cookbooks. She did, because she’s awesome like that. And she even signed them. I’ve said it before, I’ll say it again…Ree Drummond is hands down the best lady. LOVE HER. Okay, my daily Ree worshipping is done. 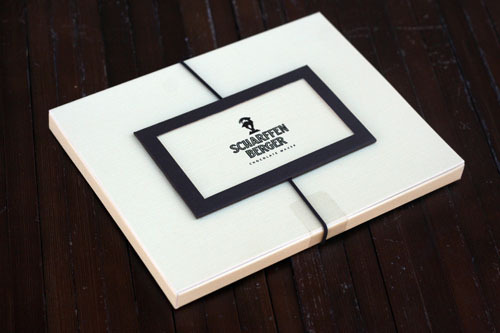 Scharffen Berger sent each person one of their folios….mmmmmm…. …Alouette sent everyone their own Extra Creamy Brie to take home…and Calphalon provided everyone with a non-stick-friendly utensil. Phew. Are you tired yet? Seriously…it was SO FUN giving everyone all these lovely things. Thank you to all the companies who shared so generously! Like I mentioned, the original idea for the party came from Calphalon. They sent me the Unison Non-Stick Griddle & Grill Pan set (which I am actually loving, by the way) and Michael Symon’s debut cookbook Live to Cook, which is where I got several of my recipes for the party. I will definitely share recipes during the rest of this week, including my own rice and grain concoction that ended up being sooo yummy. Wow, and I thought @chefdruck’s WS/Calphalon party looked good! Wish I was there, but you’d need a big patio AND a private yet. That looks like a very nice party. Those chocolates look so good. Awesome goodies! And a gorgeous table. …sigh…and to think I’ve been running around doing moving stuff all day and eating banquet food at night (Zach’s athletic and academic banquets)… Beautiful, colorful flowers too! That looks like a really fun party! what a lovely party! i love that cake. Wow! Do I ever wish one of my friends would throw this little party and invite me! Jealous would be an understatement! What a fun party!! 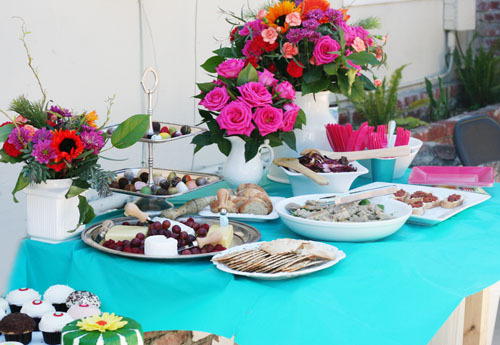 A beautiful party filled with amazing goodies and delicious food! Here’s a second testimonial, just in case anyone thinks Jane is telling a fish story: the party really was as beautiful and fun as the pictures show. wow. seriously. wow. why doesn’t one of my friends throw a party for me??? Beautiful Jane, very beautiful. What a divine way to spend the day! So sweet of you to do! Those pans look fab by the way! Ummmm, I think some cheesecake should have been mailed to me…along with a gift bag! C’mon girl, that used to be my patio and I got you the job…what better friend could there be? JK Looks like fun! Sorry I couldn’t make it. Traffic was a nightmare! Everything looks so beautiful and well put together. 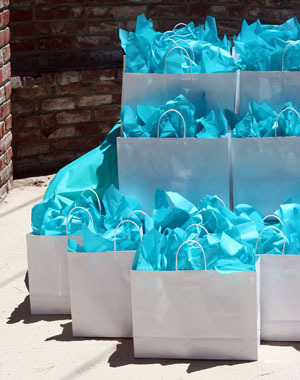 What amazing gift bags! We must get together soon! Kisses. I can’t think of a better way to spend the afternoon. The food was superb, the gifts were incredible, the company was the best. Thank you Jane!! You are an amazing hostess but an even better friend! Jane, as a privileged guest, I want to thank you. Everything was beautiful and delicious, and the swag was amazing. It was both elegant and comfortable. It is like my fantasy of what an old-fashioned tea party is like; women in pretty dresses, relaxing and enjoying each other, while eating chocolate. We should all do this a lot more often! Fun party and great swag. What a fabulous hostess you are! Jane…what lover-ly-ness. It made my day, a little bag of gifts. And what darling gifts — the bracelet, the chocolate, hard to say what I like best…oh, I know, you. Truly a magical afternoon! Great friends, delicious food, memorable conversation, darling gifts and, of course, keeping company with Jane 🙂 You were a wonderful hostess and you are a kind and generous friend! Thank you!! 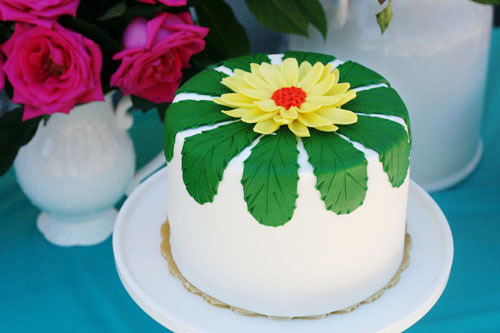 Amazing party…I’ve always wondered how they ship cakes in a box without them getting squashed! Such a wonderful party with good friends and yummy food. The swag was such a treat. Jane, you are such a great friend for putting it all together. 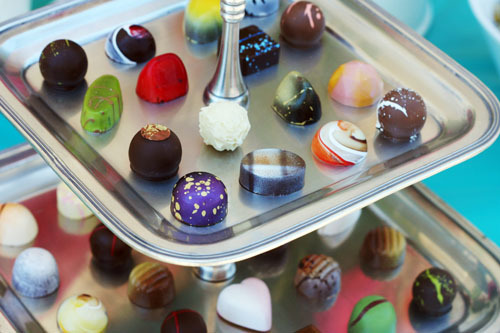 Wow, those Norman Love chocolates look stunning and delicious! Unfortunately, I’m in the UK and I don’t think they’re available here … but I’m inspired to go a-hunting for some chocolates of equal beauty. It has been a week now since the party and it is still making me smile. Thank you, Jane. I really enjoyed every bite of food, an excuse to dress up and conversation with really interesting women. And yes, the gift bag was AMAZING… thanks to it I’ve discovered I too love Ree. Thank you Jane! Your party was wonderful. I was totally spoiled by beautiful and delicious food, relaxing company and a goody bag that was amazing. I’ve already printed a few of your recipes. You are a fabulous hostess! Looks like your party was a blast, so pretty! I hosted the party as well and love my new Calphalon pans too! What an amazing time with your friends! Great products & companies as well. That beats my “tea parties” with the g/c and Primary!! looked like a fun venture!